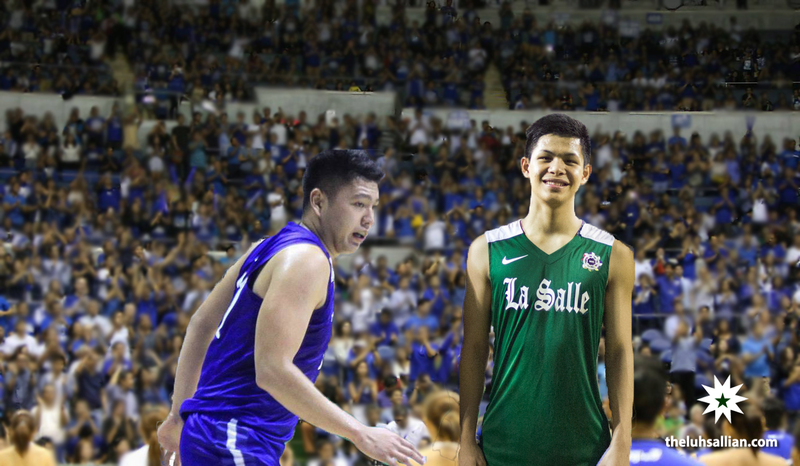 Despite currently playing for the DLSU Green Archers and the ADMU Blue Eagles respectively, cousins Jollo Go and Isaac Go have made sure that the rivalry between the two schools would not tarnish the friendship that they’ve built ever since they were little kids. “Bata pa lang kami, lagi ko na siya [Isaac] kasama. Akala nga ng mga tao na magkapatid kami pero ang totoo talaga ay pinsan ko lang siya,” the Green Archer clarifies. The people who thought that they were siblings could be forgiven as both student-athletes share the same surname, have the same passion for basketball, and possess the physical attributes that enable them to compete in a prestigious but tough league in the UAAP. Aside from eating their favorite meals together, the cousins would play video games and watch the PBA or the NBA during their free time. Isaac shares that Jollo is very passionate when watching basketball games, especially when it’s James Yap or Dwayne Wade, two of the best shooting guards that ever played the game, on television. “He really shouts every time his favorite players make a basket. I tell him nga sometimes na we should watch the games live so we won’t bother the people around us,” Isaac shares. They would soon part ways as Jollo went to Hope Christian High School, while Isaac played his basketball in Xavier School. Isaac was the first to graduate as he is older by a year choosing to continue his education in Loyola Heights. The former Xavier School standout stated that he decided to follow the footsteps of Rabeh Al-Hussaini and Greg Slaughter, two big men that led ADMU to consecutive championships during their time. The former Blue Eagles were patiently developed by the school’s basketball program and are currently playing for the NLEX Road Warriors and Barangay Ginebra San Miguel, respectively, in the PBA. Jollo, meanwhile, committed to the Green-and-White even before graduating from high school. The former Hope Christian High School standout said that he was heavily recruited by La Salle and it was his dream to play for the Green Archers. The mutual connection from both sides eventually led to Jollo taking a different path from his close cousin. “Kung nasa Ateneo ako ngayon, para kami sigurong Nieto twins, but then I chose La Salle so baka pwede kami i-compare sa Teng brothers kahit di naman kami magkapatid,” Jollo playfully says. The personal standing in the finals for both student-athletes are tied at 1-1 with Jollo winning in Season 79 as the Green Archers swept the Blue Eagles in incredible fashion. Despite playing sparingly in their first UAAP finals series against each other, the Lasallian was proud that he got one over his cousin. “Sobrang sarap ng feeling. It’s my first championship sa college and against my cousin pa,” the sweet-shooting 5’10 guard joyfully brags. Jollo’s happiness would not last that long as the Katipunan-based squad took the league by storm the following year as they cruised all the way to the finals. Unlike the finals in the previous year, the series went the distance in Season 80 as the Green Archers and the Blue Eagles needed a winner-take-all Game 3 to settle the outcome. With DLSU creeping to steal the game away from the Ateneans in the final seconds, Isaac delivered a clutch three-pointer that broke the hearts of the La Salle community. “Actually, after nung Season 79 finals, sabi sa akin ni George, tulungan ko raw siya i-expand yung range niya. Kahit na nakuha niya yung Most Improved Player award that season, he really wanted to develop his game more. Talagang ‘magis’ nga, sabi nila dun sa Ateneo,” Jollo said in reference to the school’s mantra. It seems that the rivalry between the two schools does not matter when it comes to family matters.